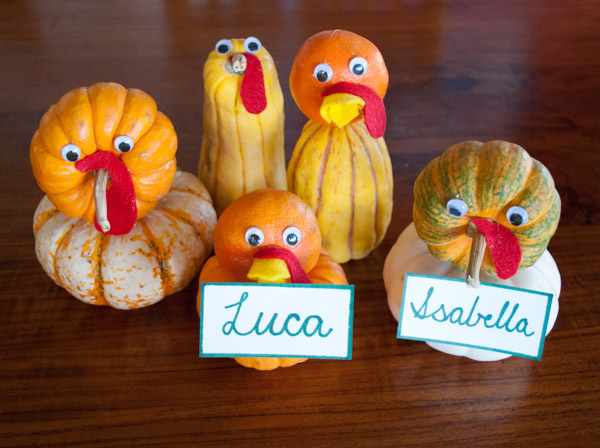 Encourage the kids to play with their food this Thanksgiving. 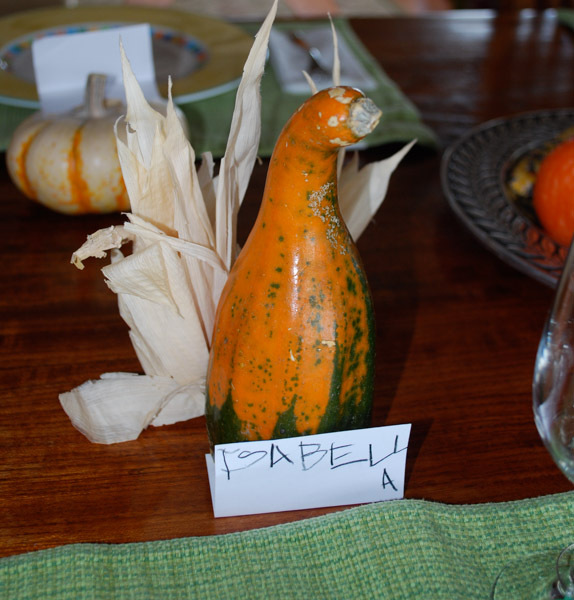 Using pumpkins, gourds and some simple craft materials you can make your own turkeys to hold your table’s name cards. Can’t find any gourds? Use oranges, apples, and tangerines instead. Use the index cards to make a name cards for each dinner guest. Use toothpicks or a glue gun to attach a small pumpkin atop a larger one. 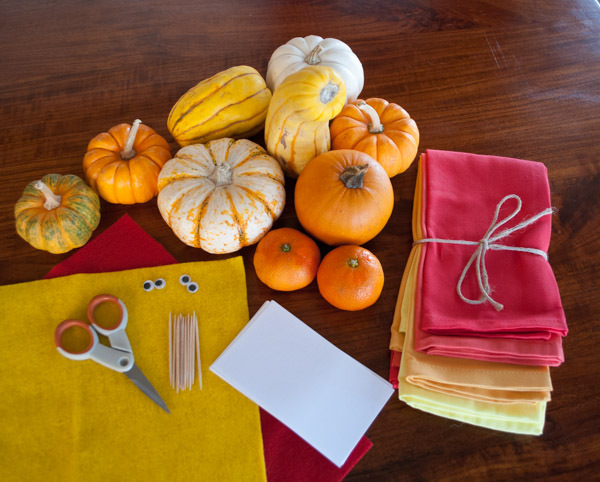 Use the stem of the pumpkin as a beak or make one out of yellow felt. If you have a crook neck squash, you can simply glue some googly eyes on. Cut a waddle out of red felt and glue it on. Use a drop of glue to attach the name cards to the turkey’s beak. 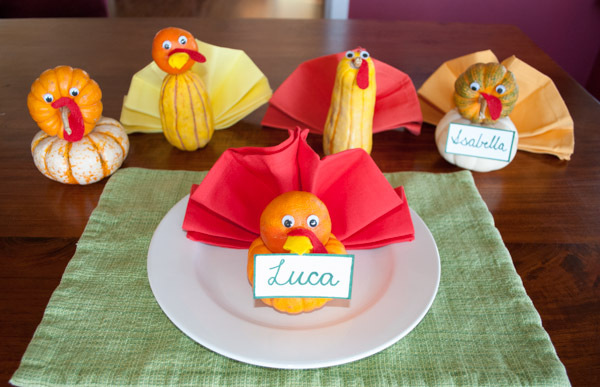 Make the tail by folding a napkin in a “fan fold” and place it behind the turkey. This becomes the turkey’s tail. http://www.realsimple.com/holidays-entertaining/entertaining/fan-fold-napkin-00000000002839/. I found it helpful to press the napkin as I folded. 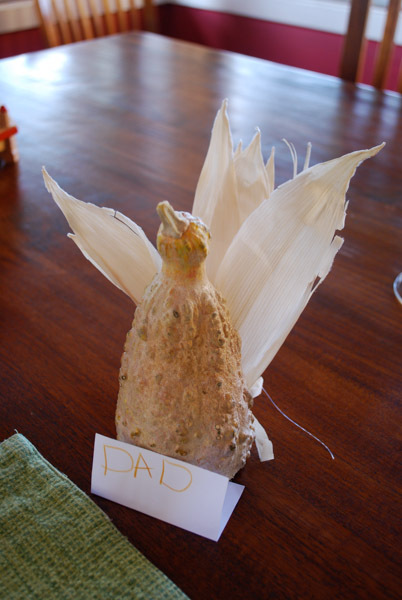 If the napkin folding is not your thing, use cornhusks to make a turkey tail. We made versions of these years ago. 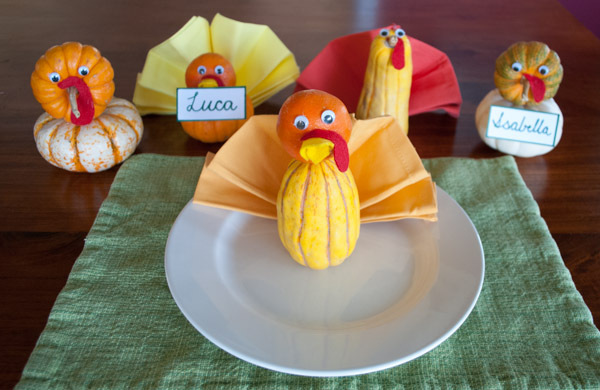 This entry was posted on November 21, 2013 by mdaucello in Crafts, Entertaining, Holidays, Thanksgiving and tagged craft, gourd, napkin, pumpkin, Thanksgiving, turkey.